Krystal's right, they're identical! I suppose I'd go with the Payless version. Those are practically the same piece of jewelry! I'd go with the the cheaper one because I'll save my big jewelry money for something more classic. I love your new picture! It has probably been there a while, but I've been a bit checked out. Anyway, such a cute picture! Oh my oh my - Payless? Really? 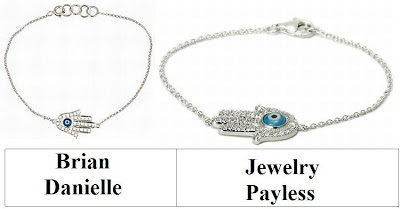 Amazing - love the Brian Danielle one but the Payless one is an incredible knock off! Ha, I think I'd be crazy to NOT go for the Jewelry Payless one! Wow what a find. I would definitely get the payless one, I mean it wont be a timeless piece so why pay the money. I'm still a fan of hamsa jewelry; actually still want to get a necklace with a gold hamsa. The Payless one is so ridiculously close.. and you can't beat the price. Another great find, E! I love finding deals like that! I found a pair of boots this weekend similar to a Jeffrey Campbell pair I wanted for a tiny fraction of the price! I actually just blogged that earlier today! The necklaces look really similar. Wow, Payless made a great version! How adorable. Love the 24.99 price too. this is such a good find! stop by my blog and check out my giveaway. And is that a new profile pic I see? You are so cute! That's great. Love the cheaper one, too. I'm totally on the Payless ship this time... the only way I'm getting $1000+ jewelry is if someone else is paying for it! Jewelry Payless for sure! Super cute but not something I'd keep forever. Holy cow! Amazing find! I'd def go with the Jewelry Payless version! i dig the bling in the Brian Danielle style! :) both are very cute! I've never been one to turn down extravagant jewels, but in this case the Payless version would be just fine! payless all the way! :) hope u had a relaxing weekend! wqw, how can it's so similiar..
but i like the necklace's shape anyway..
$1000 is just far too expensive. I'm deefinitely picking the one from Payless. Pyless for sure! They do look so similar! wow i love this bracelet. To be honest, if I can't go with the real diamonds then I stay away from stones that try to look like them :/ I love costume jewelry as long as it is "proud" to be a piece of costume jewelry... Forgive me... it's just a pet-peeve of mine! I love costume jewelry. It does depend on the quality of the piece upclose, but this looks like a fun way to get something similar to the look of the "real" one. wow how did you find this? crazy price difference here! this is SO Michael Jackson I LOVE IT!! If I had the bucks I'd go big, but no can do so it's off to cheaperville on this one for me. I have one just like this that I wear daily but it's Juicy Couture!